MUTUAL TRUST BANK LIMITED started their banking in1999. Now a day this is one of the most performing bank in Bangladesh. The report is prepared to analyze the foreign exchange department of MUTUAL TRUST BANK LIMITED, DILKUSHA BRANCH. At first in the introductory part mainly emphasized on origin of the report, objectives of the study, scope of the study, methodology and limitation of the report. 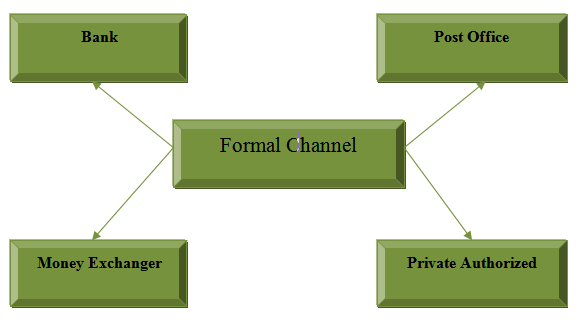 Part tow the company structure. Part three a brief discussion of the foreign exchange sector of MTBL focused on Remittance sector, were definition of foreign exchange, types of foreign exchange operation, foreign exchange market operation, structure of foreign exchange markets, foreign exchange risk management, risk minimizing tools, foreign exchange trade, necessity of foreign exchange, foreign exchange departments of MTBL, working of the export department, working of the import department and working of the remittance department, function of the remittance section, remittance of fund, foreign remittance, foreign remittance process etc. have been discussed. In Part four the Finding of the report, Recommendation, Conclusion. In the modern world no country is self sufficient, one country is to depend on the other countries and from this point of view there arises the question of foreign trade and foreign currency transactions. That is, the international trade involves foreign exchange transactions particularly for receipt and payment against export and import of goods and services from one country to another. As without foreign exchange transactions we can not think of foreign trade. Of course, various rules and regulations are to be followed in collection with the foreign trade and foreign exchange transactions. It is well known fact that the money is a medium of exchange for all transactions that take place inside the country as well as outside the country. 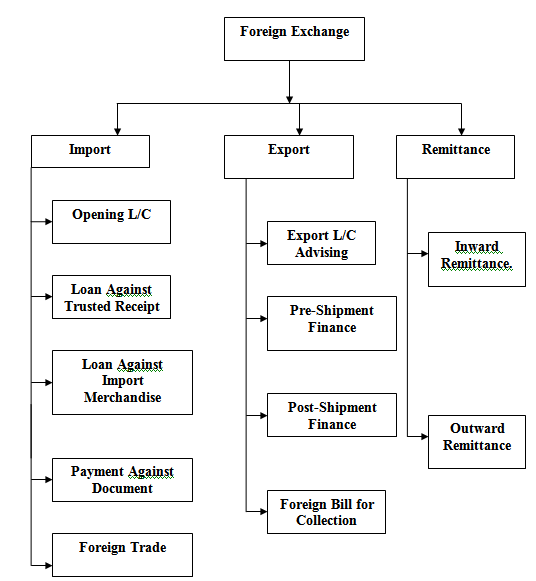 In Bangladesh, we have the Taka for financing the internal trade and other obligation. So, the home currency has to be converted into currencies of other currencies, to meet the obligation that arises out import of goods and services from other countries. That part of the economic science that deals with the conversion of home currency into foreign currency for the purpose of setting international obligations is called foreign exchange. The Foreign Trade of a country refers to its imports and exports of goods and services from and to other countries under contract of sale. No country in the world produces all the commodities it requires. A country may produce more goods if it has comparative advantage in producing such goods. A country exports its surplus goods after the fulfilment of its domestic needs. On the contrary, for domestic needs it imports necessary goods from other countries. The composition of import and export is an important aspect of a country’s foreign trade. Difference between total import and export of a country is called trade balance of that country. Positive trade balance shows if total exports received exceeds total imports payments and vice versa. Foreign Exchange means foreign currency and includes all deposits, credits and balance of payable in foreign currency as we;; as Draft, Traveler’s checks, Letter of Credit, Bills of Exchange drawn in local currency but payable in foreign currency. Foreign exchange means foreign currency and includes any instrument drawn, accepted, made or issued under clause 13 of section 16 of the Bangladesh bank Order, 1992 all deposits and credits and balances, Travelers checks, Letter of Credit and Bills of Exchange, expressed or drawn in Bangladesh currency but payable in any foreign currency. System or process of converting one national currency into another and of transferring money from one country into another. H. E. Evitt, “Foreign Exchange” as the means and methods by which rights to wealth expressed in terms of the currency of one country are converted into right to wealth in terms of currency into another. According to prof. O.M. Amos– “International trade is the exchange of goods across nation trade is the exchange of goods across nation al boundaries”. “International trade is a trade among different countries or trade across political frontiers”. Foreign Exchange refers to the process or mechanism by which the currency of’ one country is converted into the currency of another country. Foreign exchange IS the means and methods by which rights to wealth in a country’s currency are converted into rights to wealth in another country’s currency. 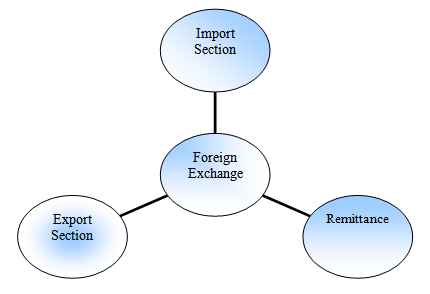 ‘Foreign Exchange’ as a subject, then it means all kind of transaction related to Foreign Currency, as well as currency instruments, such as Draft, MT, TT, TC, and Payment Order & Foreign Trade. Bangladesh Bank issues Authorized Dealer (AD) license by observing the banks performance and also the customers associated with the bank for conducting foreign dealings. To reduce the aforesaid risks an independent system is introduced which will safeguard the buyers as well as seller4 in an international trade. Actually banks play due. No country is self-sufficient in this world. Every one is more or less dependent on another, for goods or services. Say, Bangladesh has cheap manpower whereas Saudi Arabia has cheap petroleum. So Bangladesh is dependent on Saudi Arabia for petroleum and Saudi Arabia is dependent on Bangladesh for cheap manpower. People of one country are going to another country for Education, Medical Service etc. One-country export Agricultural commodities, another country exports Industrial products, all these transactions needs Foreign Currency & are related to Foreign Exchange. Foreign Exchange is an impartment department of MTBL, which deals with import, export and foreign remittances. Foreign exchange is an International Department of the Bank. 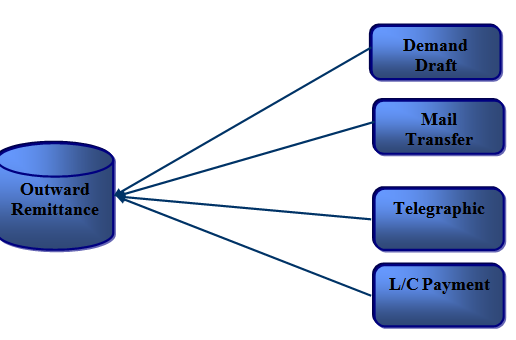 It facilitates international trade through is various modes of services. It bridges between importers and exporters. This department mainly deals in foreign currency, that’s why it is called foreign exchange department. This department is plating an important role in enhancing export earning which aids economic growth and in turn it helps for the economic development, on the other hand, it also helps to meet those goods and service, which are most demandable and not adequate in our country. The basic function of this department are outward and inward remittance of foreign exchange from one country to another country. In the process of providing this remittance services; it sells and buys foreign currency. The conversion of one currency into another takes place at an agreed rate of exchange in where the banker quotes, one for buying and another for selling. In such transactions the foreign currencies are like any other commodities offered for sales and purchase, the cost (convention value) being paid by the buyer in home currency, the legal tender. Overall supervision of Foreign Remit, Dept. Foreign TT payment and purchase of F.Drafts, preparation of F.B.P (Foreign Bill Purchased). Issuance of outward TT and FDD. Foreign Collection, Bangladesh Bank Clearing Check Collection, which comes from all branch of Mutual T rust Bank Ltd.
Encashment of T.C and Cash Dollar and Sterling Pound. Deduction of Tax and VAT on behalf of Bangladesh Bank. Preparation of IBCA and IBDA and Balancing of Collection and other special assignment as desired by Department in Charge. Compliance of audit and inspection. Handling of all incoming and outgoing foreign and local remittance is the major. Handling of incoming and outgoing T.T. Remittance of fund is to be collected in two ways. First of all, it comes from inward basis and then, it happens outward. A pay order is a written under, issued by a branch of the Bank, to pay a certain sum of money to a specific person or a bank. It may be said as to be a banker’s cheque as it is issued by a bank and payable by itself. 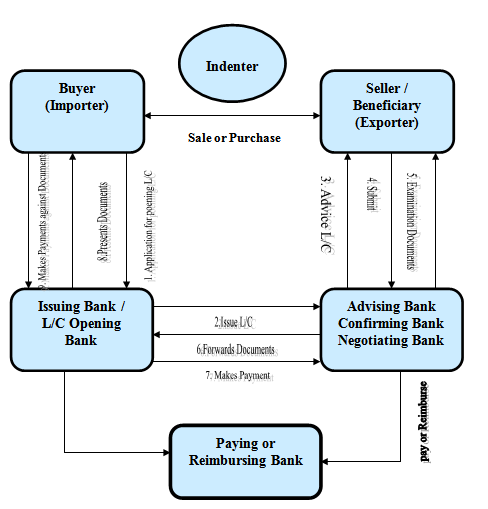 This is an instrument through which customers money is remitted to another person/Firm/organization in outstation (outside the clearing house area) form a branch of one Bank to an outstation branch of the same Bank or to a branch of another Bank (with prior arrangement between that Banks with the issuing branch). 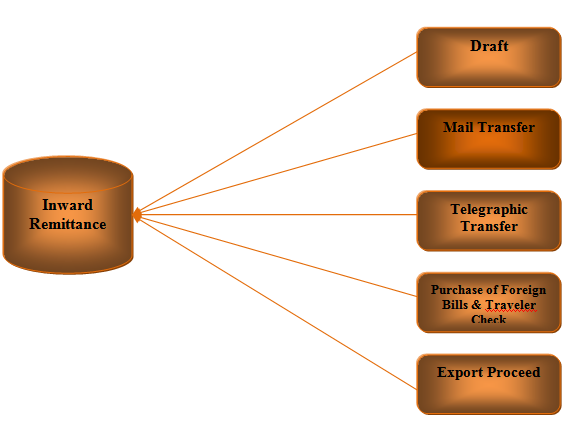 A Telegraphic Transfer is a method of remittance, which is effected by the banker through a coded telegram attested by secret cheek signal, on receipt of which, the paying office pay the amount to the payee by crediting his account. Fund transfer from one country to another country goes through a process which is known as remitting process. Suppose a local bank has 200 domestic branches. The bank has corresponding relationship with a foreign bank say-“X”, and maintaining “Nostro Account” in US $ with the bank. Bangladeshi expatriates are sending foreign remittances to their local beneficiary, through that account. Now, when the Bangladeshi expatriates through other banks of different countries remit the fund to their “Nostro Account” with “X”, then the local bank’s Head Office international division will receive telex message and the remittance section will record the advice and generate the advice letter to the respective branch of the bank. The branch will first decode the test, verify signature and check the account number and name of the beneficiary. After full satisfaction, the branches transfer the amount to the account of the beneficiary and intimate the beneficiary accordingly. But some times the complexity arises, if the respective local bank has no branch where the beneficiary maintains his account. Then the local bank has to take help of a third bank who has branch there. Remittance comes from foreign countries to our country is called inward remittance. To the bankers or ADs inward remittance means purchase of foreign currency by authorized dealers. Generally, inward remittances are received by draft, mail transfer, TT, purchase of foreign bills & travellers Cheque, export bills. 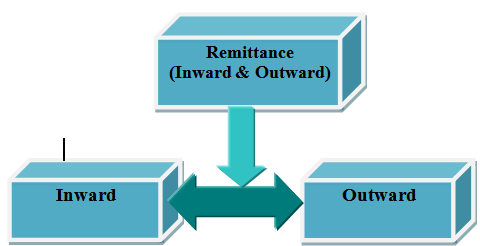 Basically, these are the formal channels of receiving inward remittance. A local bank also receives indenting commission of local firm also comes under purview of inward remittance. Remittance from our country to foreign countries is called outward foreign remittance. On the other word, sales of foreign currency by the authorized dealer or formal channels may be addressed as outward remittance. The authorized dealers must utmost caution to ensure that foreign currencies remitted or released by them are used only for the purposes for which they are released. Out ward remittance may be made by appropriate method to the country to which remittance is authorized. Most outward remittance is approved by the authorized dealer on behalf of Bangladesh Bank. Balance amount of F.C account. Fund transfer from one country to another country through official channels, i.e. banking channel, post office, and other private service channels, such as – Western money order, Neno money order etc. Fund transfer from one country to another country through hand by hand or over telephone in an unofficial channel like as “Hundy”. 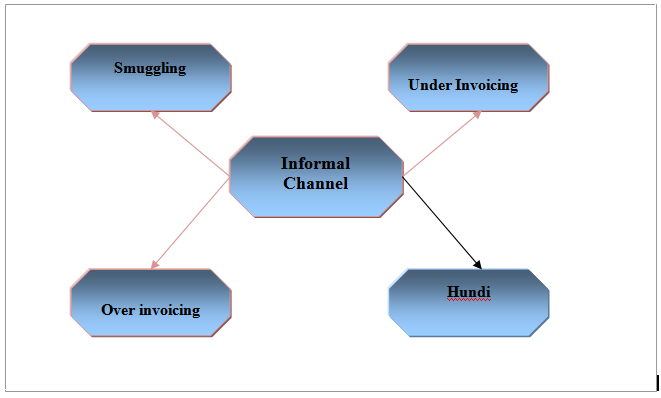 Haque (1992) comments, that remittance collected by informal “Hundi” rings operating in Middle East countries and UK are also used to finance illegal trade and transactions. Islam (2000) observes that as informal channel is needed for illegal trade of goods, as well as gold and drugs into Bangladesh, and therefore, helping the ever-present problem of capital flight out of Bangladesh. Dealing in arms & ammunition. Evasion of exchange regulations/ control.